Square Footage 112 sq. 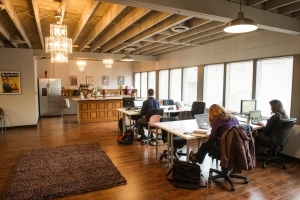 ft.
Make your small team a part of our coworking community for $1125/month. 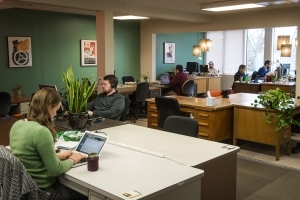 Works Progress is primarily a coworking space. That is it’s a communal, open floor plan office for people who work in a variety of professions. 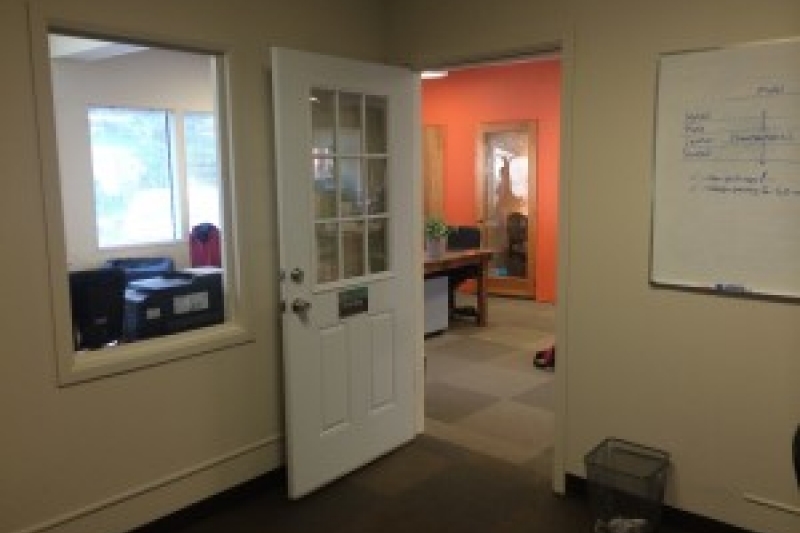 We have 6 private offices for teams and those that need more confidentiality. Private Offices rarely become available, but inquiries are welcome. Be a part of the community, but have your own space to focus, spread out, meet clients, and store your confidential documents. A team of three could fit comfortably and dogs are welcome! Hi-speed Internet, site security, printing, scanning, fax, and mail service. Shared kitchen with free coffee and tea. Your business name on our lobby directory. Free parking is available in the back of the building on a first-come, first-served basis. Furnished or unfurnished, as needed (note that our office furniture comes as is). Access to the event space/classroom for special events. Access to scheduling for meeting rooms. Month to month rental or long term. No hassles. Must sign our Team Room sublease agreement. A $1125 refundable deposit is due at the time that you start. The deposit is returned on your last month or used for that month pay. Must cancel within 7 days of the next billing cycle. We are a Coworking Space for independent and socially minded workers and small business owners who’d like to work around other people. 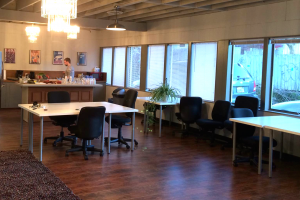 We have meeting rooms, private offices, event and classroom space and open coworking areas. Our event and classroom space is available evenings and weekends and has great lighting for photo shoots. Our high speed wifi is available throughout the building and our comfortable, “nerd” decor should make anyone in the creative field feel right at home. We are open Monday-Friday from 8am-6pm and 24/7, 7 days per week for our full time and private office members. The event/classroom space is available anytime weekends and evenings after 6pm. We have free on-site parking for up to 8 and free street parking throughout the neighborhood. Security cameras, keypass secure door entry to the building, keycode entry to the full time suite with security alarm for after hours. Business Internet, Ethernet, and firewall.